Part 3: Can We Really Play “Relaxed”? Piano technic can be a tricky proposition. Getting just the right degree of muscle tonus 1 in some tissues while maintaining a different state of flexion in others is tough. Especially when one is trying to move at the same time. Too much tonus and movement is difficult or even painful; too little, and movement becomes impossible because too relaxed. We’ve taken an important first step in working on thumb motion. Now let’s begin work on what I consider to be the foundational movement of piano technic: rotation. As I said in my first blog entry in this series, we try to base our piano-playing motions on the “natural” motions of our arm and body. Rotation is one of those. Matthay wrote in the spirit of 19-century scientific experimentation, in a technical language that, to me anyway, is difficult to make sense of. 4 The basic principles, though, are clear. I begin by asking students to let their arms hang with their hands at their sides, as if walking. Notice that, in this position, both the thumbnail and radius bone are facing forward. In order to place our hand on the piano keys to play, we have to lift our arms (from the forearm) and rotate the forearm 5 so that the thumbnail and radius are facing medially, to the center of the body. This is called “pronation”. Pronation is not an uncomfortable position, but the arm naturally wants to rotate back to its initial position, with the thumb and radius facing upward. We want to take advantage of this natural inclination and use it in piano technic. 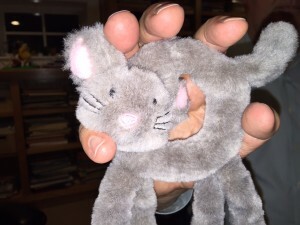 Hold the cat toy in your hand with enough muscle flexion to keep it in an upright position, but not so much that you squeeze the poor little cat too much and make your hand stiff. Pretend the cat toy is doorknob, and you are going to turn it. Turn it to the left, then to the right. Is it really this easy? Yes, in a way, as you get started (the nuances will take more time). Here are some things to check as you start to master the gesture. Make sure the motion is initiated from your forearm. Medial rotation (pronation) necessitates a slight repositioning of your elbow, out and up. But don’t let it waggle too much! Practice with your own stuffed animal, or even a doorknob until you get comfortable with the basic movement. We’ll apply it to music in my next blog.